With the year drawing to a close we need to decide on a picture that we will use for the main picture on the cover for 2019 club calendar. For the next couple of weeks we will be accepting picture nominations. The nominations do not have to be your own picture, but it does have to be of a train and/or scene on the club layout. If the picture is not of your train that person will have to give their permission if their picture is selected. Starting now until December 10 we'll be accepting your nominations. After that date I will set up a poll with the nominations on December 11 after which all members can vote for their favorite photo. Nominations can be submitted via e-mail. More than one nomination for any single photo will not give it extra weight in the contest. 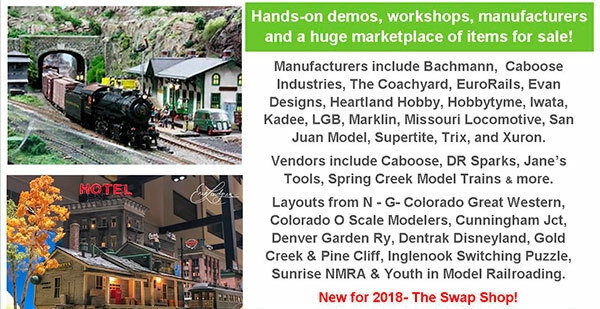 Join us at the Rocky Mountain Hobby-Expo!